How does that saying go - "measure twice, cut once"? Today I learned the hard way that it really is true. 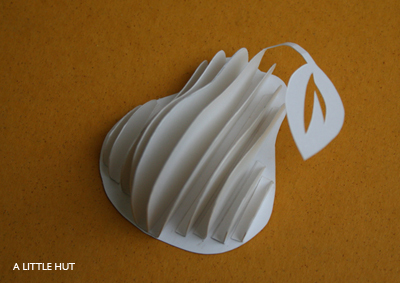 Here is a prototype of a little pear that I was experimenting with. After perfecting it I was planning on using it for a shadow box piece and now it doesn't fit! Grrr... Back to the drawing board. Inspired by our costume shopping for the kids today (no time to make them this year), here is another little project I worked on today. It was really easy to make but now I have to figure out how to hang it near/or on our front door. By the way, I purchased the light rope today (in the Christmas decorations section) and was shocked by what I read on another box of lights which I certainly did not purchase. There was a warning label (I don't recall the brand) that stated that there are know cancerous effects caused by handling the wire of those particular string lights. "Wash hands after handling" was part of the warning. Ok... hmmmm what the heck!!!!? And these things are on store shelves among countless other items which may be similar in nature? Unbelievable. Where have I been? I'm normally good about reading a box of anything before purchasing it but now I will really be more vigilant. To end with something a little more fun... Check out a Blogger feature, that I just found out about, called Blogger Play. It allows you to view photos that have recently been uploaded. It's fun to sit and watch for a while. Enjoy! I love the top photo. nice blog! This is amazing! 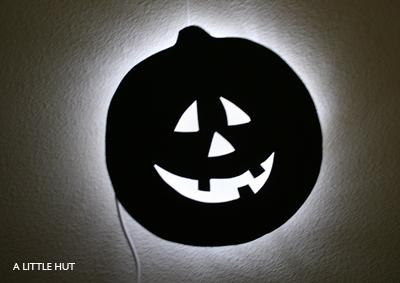 LOVE the pumpkin and the other ideas as well! Linking to you soon!!! The BloggerPlay feature needs to come with a warning label - could contain adult content. Whoops. So sorry about the pear. At lest all of us out here in blogland could appreciate it! It is beautiful. I too am intrigued by paper and what can be done with it! That magazine bowl is something I would like to try out!